Choosing a monument retailer can be a difficult task. An established monument retailer with an honest reputation should be chosen. They should be a "full service" retailer, meaning that memorials should be their main business, not an add-on to some other business they do. The monument retailer should be able to provide you with a wide range of choices for headstones so that you may select the right headstone for you and your family. The monument retailer should work with you to create a Cemetery Monument that is unique and beautiful. When looking for a monument retailer, inquire about work guarantees. You will want to have a retailer that will stand by their work for years to come. We have provided a list of Monument Companies that have been proven to meet these requirements. Francis G. Ozog Funeral Home, Inc. in no way guarantees the work or merchandise that is provided by these companies. There are many cemeteries and almost as many regulations. In order to determine what type of Headstone you can have, you need to first determine what the cemetery will allow. Your monument retailer can help you determine what a cemetery will allow. 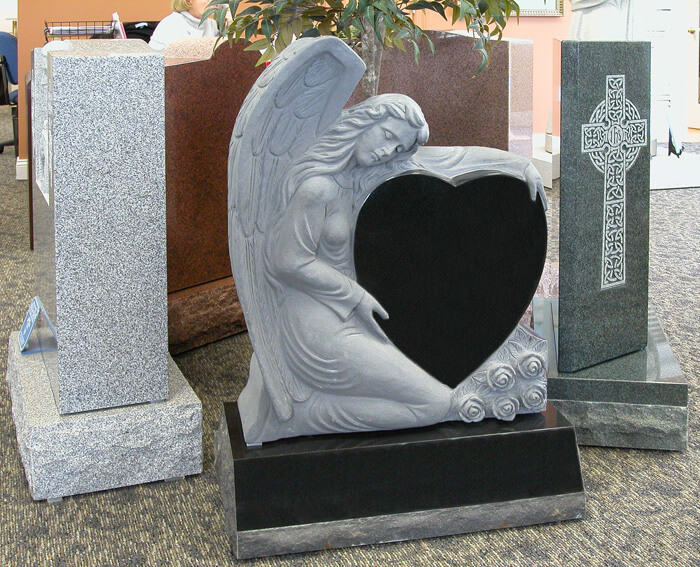 Cemetery Headstones come in a variety of shapes, styles and sizes. Some traditional options are upright, slant, and flush. Uprights provide the most room for inscriptions and stand straight up. Slants have a slanted edge where the inscription is carved. Flush markers are grave markers that can be laid flat on the ground. You can customize any of these shapes to fit your needs.